Are you interested in changing the social media management software app that you use? There are literally hundreds of social media management tools available in the marketplace and it’s difficult to choose which one would be the most suitable. So we have picked out 11 of the very best for you to consider. Hootsuite offers a broad range of support for social media management platforms and is the most used of all the different platforms. It has over 8 million users, but the majority of them use the free version of the service. Full publishing facilities across a broad range of social networks – Twitter, Facebook, LinkedIn, Google+, WordPress and Mixi. Reporting available, but very limited at the free level. As you move to the pro level you can pay extra money, depending on the level of reporting required. App Directory – They have an application directory with over 70 applications supported which is quite useful. See our recent post on Hootsuite apps. Team Management – You can create teams, assign tasks and set permissions across teams. RSS feeds – You can set up RSS feeds for Hootsuite to read and automatically share content from. Pro price starts at $9 per month for first user and you get one user free. Pricing increases to $19 for the next 8 users and then you’re into enterprise pricing after that. Hootsuite is a powerful tool with a good free offering. You hear a lot of complaints about the user interface but, if you can get used to that, it does provide good functionality. There is an enterprise-level offering for Hootsuite but, if you are a very large enterprise, there are other tools, mentioned below, that are also worth considering. Sproutsocial is a nicely designed social media management software platform that it is easy to use and produces nice reports. There is no free offering so it’s difficult to recommend it over Hootsuite if you are a one-person team. If you have multiple members of a team working on social media then it is a good alternative, although it’s still more expensive. Supports Twitter, Facebook, LinkedIn, Google + and also integrates with Feedly and RSS feeds. Task management so you can assign tasks to teams. Automatic publishing of content at specified times, with a browser plugin to share content while browsing. 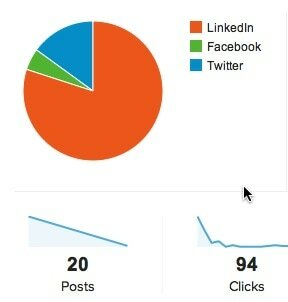 Good overview analytics provided for social media and the web through integration with Google Analytics. Discovery tool to find people to follow or unfollow, and to manage keyword-based searches. Pricing ranges from $39 to $99 per user per month, depending on functionality and support provided. At $39 per month you are restricted to 10 social profiles. At $59 you can manage up to 20 social profiles and you get Google Analytics integration, and at $99 you can manage up to 50 social profiles, getting better support, reports and advanced scheduling of content. It’s a really nice tool to use, and it’s perfect if you have multiple team members. To get the full benefit you’re going to need to go for the $99-per-user version, which means it gets quite expensive. So any reluctance to use it would be based on the price alone. 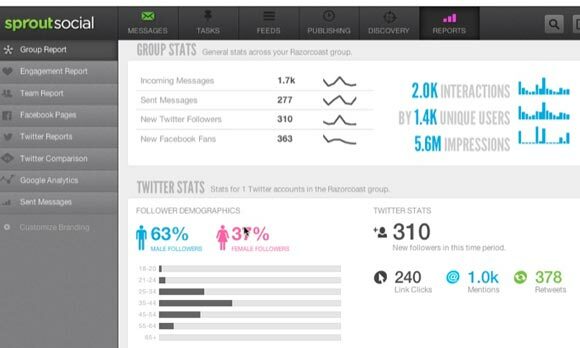 Rignite helps you measure and understand your social media marketing activities. It is good for smaller teams and covers the most popular social networks. Its power is in the fact that it’s available for single users while still incorporating all the powerful analytics features. Manage an unlimited number of accounts on Facebook, Twitter, Google Plus, LinkedIn, Instagram and YouTube. Sentiment monitoring and trending topics analytics. Analytics and reporting for every social account and every team member – find where you need to work more and who is performing the best with community management. Create and manage promotional campaigns from your dashboard. Team collaboration features that let you communicate better – content library, discussion forums, templates. Rignite offers prices that are suitable for the small business owners – $19 or $39 per month. An additional user costs $19/month for both plans. The difference between them is the campaign-level analytics and the social campaign management panel – both available only for Gold subscribers. It is a good solution for small businesses and independent consultants who need more in-depth information about the campaigns they are running. The easy-to-understand analytics make Rignite good for beginners as well as professionals. Meshfire is a social task board that lets your team manage Twitter faster and better. With the help of the virtual team member – Ember – you can filter, assign tasks, collaborate and much more in one single dashboard. 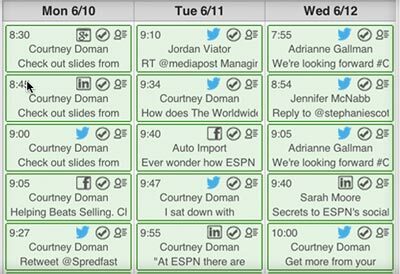 Automated task board that selects the most important tweets, such as those where you might need to take action. Saves time, compared to following the real-time newsfeed, and minimises the frustration of missing something important. Assign tasks to another member, comment and engage with the community. Use the virtual team member to do the hard monitoring work – for recommendations, actions, etc. Meshfire offers plans from $19 for a single power user to $99 per month for an agency. You get different number of projects, team members and contacts with every level. It is a great tool if you are managing a lot of really active Twitter accounts and you just can’t cope with all the information. Postheads is focused on collaborative content creation. Based on the assumption that everyone in your team is participating in the content creation and management process, this tool gives you the possibility of sharing different types of files with other account managers for the different accounts you manage. So, if you find a great article or a photo that would be great on your Facebook page, it won’t get lost. Content collection – add all the files in the relevant folders for the account that you want to manage. Approval system – Set up a full approval system for all content shared. Publish on Facebook and manage your content calendar – see how many posts you have planned for the days and weeks ahead, and what types of posts they are. You can choose a package that suits your needs in term of team members, number of projects and cloud storage space. Monthly fees are in the range of $200 to $1000. Discounts are available per 6-month or yearly payment. This is a good solution for teams that are managing a lot of content and require an approval process. It’s a pity it’s Facebook only at the moment but Twitter is on the way very soon! Falcon Social is a social media management software tool for big agencies or global companies that manage a lot of social media accounts via different teams. The possibility of assigning different levels of access for every team member and for every account makes it interesting for larger companies. The Listening platform is their newest feature and it offers unlimited capabilities to find the right audience, participate in conversations and turn people into real brand ambassadors. Supports publishing to Facebook, Twitter, Google Plus, Tumblr and LinkedIn via a detailed editorial calendar. Includes an image editor, application builder, and targeting options. Team management that lets you create teams, add people to more than one team, and assign levels of access for every user and team. Listening platform – Track what people are saying about a brand, product or competitor. 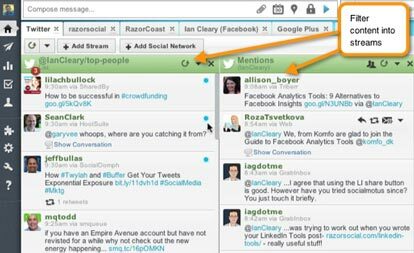 Real-time collaboration for better community management and higher engagement. Mark a message as read, assign to another member, add notes and take action. Detailed reports about Facebook Page performance including earned, paid and owned media, negative feedback, and real-time reach graph. Falcon Social is an Enterprise solution, which means it’s costly for small business owners. The pricing depends on the number of accounts you need to manage. Falcon Social offers great solutions for global companies and big social media agencies. This tool provides all you need in a single dashboard including Facebook Ads management, real-time statistics and newsfeeds. If you manage a big team and a lot of clients, go for it. Komfo is a comprehensive and powerful social media management application with a really nice user interface. It offers support for the most popular channels, in-depth analytics for Facebook Ads and a good Facebook App builder. Supports Facebook, Twitter, Instagram, YouTube, Google Plus and LinkedIn. Content calendar for easier publishing. Monitor your community – assign to another team member, manage responses and save for later. Listening – monitor up to 5 queries per brand to see what people are saying about you and similar brands. Find conversations where you could be helpful. Social analytics – see your most viral, engaging and spammy content. Learn how to change your content strategy for better results. See the monetary value of your reach, compare basic results with competitors and active ad campaigns. App Library that lets you create and publish an app quickly and easily. Choose a template based on your goals and start editing. You will need to contact Komfo for pricing as it depends on your project, but it’s an enterprise tool so not for the smaller business. Komfo has some really nice features – the Analytics part is my favorite because it saves time and frustration by showing you the most important metrics in a way you will understand them. If you manage a lot of Facebook Ads for your company or clients, this is a great addition. Oktopost is a platform particularly suitable in a B2B environment. We often talking about the requirement to track the results from sharing content on Social Media and Oktopost has got excellent mechanisms for this. All links can be tracked and with it’s integration with Google analytics you can monitor the results. It also has excellent features for LinkedIn group posting and monitoring the results of content posted. Prices start at $49 per month for one user. For three users it’s $119 and for five, it’s $249. For each level you get support for more social media profiles and LinkedIn groups. A really useful solution particularly in a B2B space. The ability to track all links shared is usually difficult but Oktopost makes this particularly easy. Spredfast is an enterprise-level social media management solution that includes support for a broad range of platforms and functionality that you would expect for a system designed for enterprise-level clients. Supports Facebook, Twitter, Google+, LinkedIn, WordPress, YouTube, Foursquare and Slideshare. Provides a centralized content library where your teams can access content based on permissions. Comprehensive workflow and permission-based management that is easy to configure. Systems in place to identify and track the most relevant conversations your team should be involved in. Detailed analytics module with integration with Google Analytics, Omniture and Bit.ly. Other integrations available including Brandwatch, Bazaarvoice (ratings/reviews), Kenshoo, Klout and Salesforce. Mobile – All management capabilities are mobile compatible. This is enterprise pricing that really depends on the type and size of the organization, so it is generally different for every company. It’s big bucks! For a complex enterprise solution I was surprised by a user interface that is not overly complex. The fact that they provide an extensive range of functionality and support for platforms such as Slideshare is really useful. The integrations they provide to third-party platforms are also impressive. So, overall, this is a great solution but you’d want to be a reasonable-sized company before it made sense from a cost perspective. 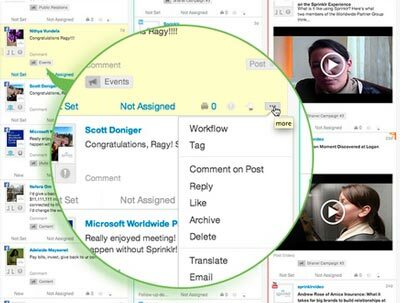 Sprinklr is another enterprise-level solution and is a competitor to Spredfast. It appears more complex than Spredfast but it does have a very broad range of functionality and it supports a wider range of platforms. Typical deployment time for Sprinklr is four to six weeks. Supports Facebook, Twitter, LinkedIn, YouTube, Slideshare, Instagram, Flickr, Weibo, Tumblr and VK (Russian social network). Excellent workflow system that allows you to create complex workflows, including automated tasks such as the automatic routing of information. Through a proprietary natural language processing engine it surfaces the most important conversations so they can be acted on as soon as possible. Extensive reporting options with reports available across individual, group or brand. You’ll need to check with Sprinklr directly as it’s based on your requirements. This a very comprehensive platform and very suited to enterprise customers. It’s not suited at all to smaller customers. It is similar to Spredfast, with possibly more functionality, but it will also be more expensive to deploy and manage going forward. 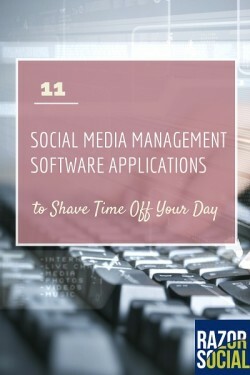 Symphony is a nicely designed social media management software tool with some really great functionality. For example, when you are sharing posts you can do an image search and easily add an image onto any post you’re sharing; this is a neat feature. It also has good team-based functionality where you can assign permissions to different team members to restrict access. Workgroups – Separate your personal and work accounts and give access to different people. Crosspost – Send scheduled posts to a variety of platforms by specifying a time or adding to a queue. You can also add RSS feeds and set up automated posting through these. Image selection – Built into the ‘crosspost’ is the ability to select from Creative Commons images (free to use) and add them to posts. Inbox – Filter messages by type of interaction, brand mentions, etc. Never miss a comment – easiest way to respond. Write emails and chat with your team directly in Symphony. No need to use a separate project management platform. Chrome extension – You can use the extension to post from anywhere on the web. You can choose between 3 packages – $14, $29 and $99 per month. The first package doesn’t include Monitoring and Replying, as well as Teams. Nicely designed with some great functionality for adding images while posting. Also some very good team management functionality available. If you invest time in selecting the right social media management software app for your business, you can become more efficient and effective with social media. But you need to spend the time evaluating the solutions available and matching them to your needs. a) Consider one of the social media management tools listed above. c) Let us know your thoughts. What other tools should we have covered? What’s your favorite tool and why?